I was looking for a Halloween costume in 2009; that was the year the movie Whip It was newly released and Roller Derby Girl was a popular choice. In the search results I noticed Dallas Derby Devils. Try outs were less than two weeks away, I hadn't skated in almost 20 years but I told myself I would try out the next year; I did and the rest is history. I've always liked the name Zoe, so I mixed it up with my name - Kat - and added Karma just because ... I mean, who doesn't like Karma? I have so many great memories, one that stands out is the next to last game of my second season. My team, the High Seas Hotties, was playing the Wrecking Crew, something special that night just clicked and I had a great game. I remember feeling so strong, both body and mind; in that moment I felt like a million bucks! Haha - yes. Let's just say I used to joke my mash-up name would be Medical Leave. After multiple injuries (not all due to derby), I stepped down from my team and ultimately joined Dominion as a Non-Skating Official. What's the most rewarding aspect of being an Official? Besides being able to support the League I love, I have the opportunity to be involved with an organization whose mission is to empower individuals, both on and off the track. I have made strong friendships and have met some really amazing people. I also like being proof there is always a place for you in derby and am honored to be Chairperson of the Officials Committee. What is your favorite Non-Skating Official position to work? I do enjoy working the Penalty Box. I am not sure what that says about me, but I do. I like to write poetry and travel. One day I will find a way to incorporate that into a paying day job. Volunteering for this sport is a huge commitment. How do you juggle that along with your life outside of derby? After stepping away from skating on a team, it took me almost two seasons behind the scenes to commit to volunteering as an Official. I knew the time commitment involved and only committed when I knew I was ready for it. In life, we make time for what we want to do and I want to do derby, in some way, shape or form, so it is a priority of mine. My daughter is grown and I am able to choose what I spend my free time with ... and DDD is one of those things. It can be a juggle at times, but I'd rather juggle it than not have it. Rest and meditate. Game nights are always so high energy, it is good to be calm and ready for anything that comes your way. If you could give any advice for someone interested in becoming a Non-Skating Official, what would it be? ASK ME ABOUT OFFICIATING! Did I just scream that? Yes, yes I did. If you are a retired skater, we have a place for you ... a new derby fan, we have a place for you ... a friend/family member/significant other of a skater or official, we have a place for you. Come find me at a game and I'll invite you to a practice - who knows, you might be the newest member of Dominion! I was at a nightclub where I found a flyer for a roller derby game. I didn't have anything to do the next day so I went. I kinda expected a spectacle like midget wrestling since it advertised BYOB, BYOchair... And it kinda was. It was in a dimly lit roller rink with all sorts of flashing lights. The teams all had amazingly themed outfits, like the slaughterers with blood splattered aprons. There was rope light lining the track. The refs kept tripping over the power cables to the rope lights. But what these ladies were doing on the track was amazing. It was like watching two teams of Xena Warrior Princess Ninjas on skates using the Force to do all sorts of crazy or brutal moves on the track. I was hooked! I sometimes miss the old crazy spectacle days, but I'm also proud to see how the league and the sport has grown into more maturity with nice venues, good lighting, and professional looking uniforms. The improvement in the skaters is even more impressive! 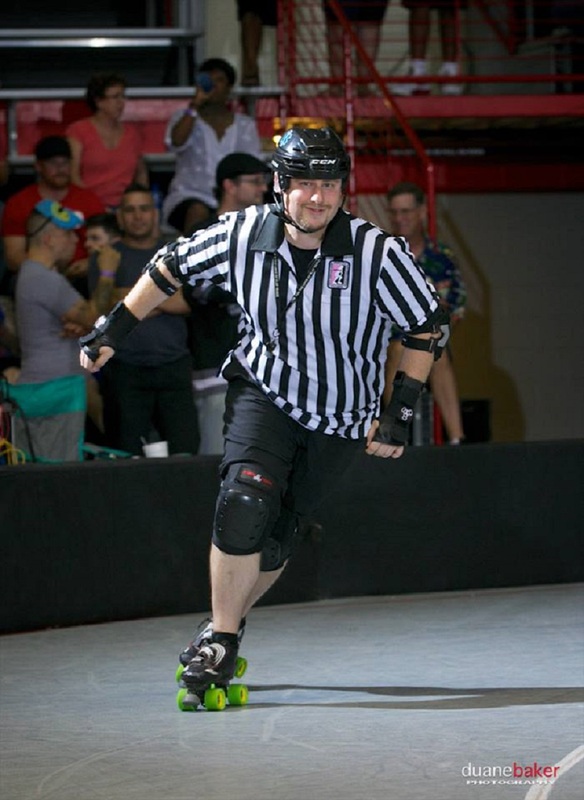 I was a Paramedic and supposedly every ref really hates skaters. As a medic I was also a medicator. So Medic Hate Her was born. Officiating at my first Clover Cup was greatness! I was able to meet and work with so many amazing officials from all over the country. We were all from different cultures and interests in life, but here we were, all helping make our favorite sport happen. I broke my leg trying to sprint on my toe stops about 3 months into starting. I grew up skating on inlines, so transitioning to quads took a bit of work. But I did what the doc said and came back. And now I'm able to do most of those fun skate tricks I've seen other people do. And while I'm not technically supposed to take a hit, derby happens. So at least I can usually stay on my skates and my eyes on the skaters when the hits do happen. I get the best seat in the house for the games. Officials really are the biggest fans. We love the game so much that we learn as much as we can about it and work with the skaters to make it all happen. The networking with other officials around the country is also fun as we all learn to make sure we are putting on the same game with the same interpretation of the rules no matter where everyone is. What is your favorite Skating Official position to ref? My favorite is outside pack ref. You get to skate fast, maneuver a lot, and help the inside ref positions keep track of everything. Hiking, Goth Clubs, Traveling, Swimming, Running, playing with animals, some computer games and anime conventions, and I occasionally practice my harp. It's not easy. I work nights as a nurse in an ER now. If I can get things scheduled 2 months in advance it is so much easier! I try to go to the DDD practices that I can make it to. Otherwise I will drop in on other league's practices. Sometimes I'll travel out of town to officiate games to keep up to practice, see how other people do things, and make sure we are all on the same page with how the game is played. Caffeine and water. It is by the beans of java that my thoughts acquire speed. If you could give any advice for someone interested in becoming a Skating Official, what would it be?